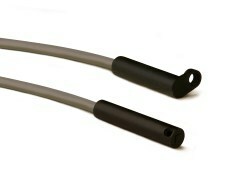 March 15, 2011 – Canfield Connector’s Series 8F small, rugged reed type proximity sensor is designed for applications where critical magnetic sensing is required. This compact magnetic sensor is small enough to fit most space requirements and its cylindrical shape is ideal for mounting in either a simple hole or cylindrical opening. The 8F has a tough nylon shell that is over-molded with polyurethane to create an environmentally resilient seal from the elements, is corrosion and washdown resistant, compatible with IS (Intrinsically Safe) barriers and is NEMA 6 and IP67 rated. Also available in a tab mount version, the 8F can operate in a temperature range from -20° to + 80°C, is shock resistant to 30G and vibration resistant to 20G. A 9 foot cord or an M8 quick connect connector is standard and the 8F is available with either a normally open or normally closed switch type.